We have no administrative fees at The X-Man Foundation because we are just a handful of volunteers that assist Valetta Bradford in her campaign ‘Don’t text 4 X’. We are a grassroots organization coming together because we feel ‘the Story of X’ is the most powerful tool we have at this time to give drivers pause before a determined course of distracted driving. You may donate directly to Valetta Bradford our founder through her personal email valettabradford@gmail.com. Valetta is set up with Paypal at this time. We look forward to embedding a donate button on Valetta’s Facebook page as soon as that becomes available, we are on a waiting list. Facebook is working on installing money changing capabilities for all Facebook users and that feature may become available before the donate button is offered. Either way you can be assured that your donation, X, will indeed further the campaign ‘Don’t text 4 X’ with the proceeds going directly to Valetta Bradford, the mother of Xzavier Davis-Bilbo, and those donations will help Valetta and Xzavier continue on in their campaign ‘Don’t text 4 X’. The X-Man Foundation is a federally recognized non-profit organized under section 501(c)(3). Transportation is an issue at this time. The wheelchair accessible van completely broke down last fall and so Valetta and Xzavier have been getting around on public transportation. Public transportation is taxing enough on able bodied persons. For Valetta and Xzavier it is a feat that requires transporting Xzavier’s respirator and medical needs along with whatever is needed for the day. Valetta and Xzavier make public appearances at high schools, colleges, universities, driving schools, and other events. 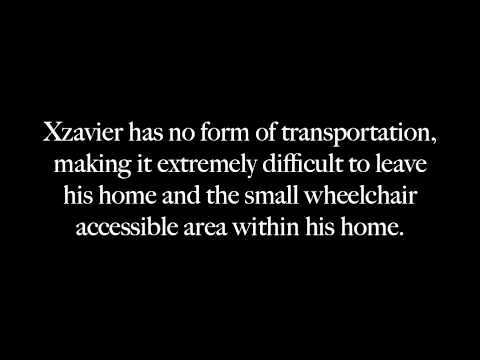 Xzavier has had to sit out a few appearances due to the lack of transportation. To top it off, Xzavier’s motorized wheelchair is broken. These two repairs are priorities for the campaign. Valetta and Xzavier want to get back out there and continue on the campaign ‘Don’t text 4 X’. Meeting Valetta and Xzavier is a profound experience for the drivers that they do reach. Valetta and Xzavier have also appeared on film on several occasions through the ‘It Can Wait’ campaign, the Katie Couric interview, and local Milwaukee news stations. On October 10, 2010, Xzavier and his older sister Aurie were crossing the street in the crosswalk of Lee Elementary School near their home. A distracted driver flew by the four way stop sign and struck Xzavier in the confounds of that crosswalk. Five years later, Xzavier is paralyzed from the diaphragm down and he depends on a respirator for his every breath. He recently had an operation on his right arm in an effort to save what function the surgeons could save for Xzavier. This is not a story that should be swept under the rug. Especially when no one is talking much about the dangers of distracted driving. We know because we have heard every excuse in the book why drivers keep using their cell phones while behind the wheel and we know because family members brush us off when we try to engage them in in-depth conversations about what is going on out there on our roads. We know because we visit the Department of Transportation website and look at statistics. We know because we share the roads with distracted drivers. Please support our campaign ‘Don’t text 4 X’ with X amount of dollars. This is work that may save your life or the life of one of your loved ones someday, OR, this work may give you pause before a determined course of distracted driving and we have just prevented you from becoming an unintentional killer. Contact Spokeswoman Valetta Bradford at valettabradford@gmail.com and request a Paypal page to make an X donation today!